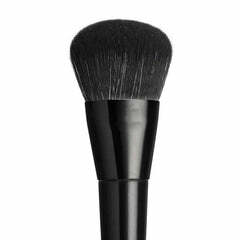 Awaken your complexion with this professional buffer brush. Perfect for applying liquid foundation, primer, concealer and more, you’ll love applying your makeup with a high level of control. You can also use it for buffing mineral makeup, while using the angled edge to apply blush more dramatically for a chiseled effect. The brush is made of cruelty-free vegan bristles with an amazingly soft texture, which feels delicate on your skin. 19.5cm full length. Bristles - 3cm high, and 4cm wide.